Läther’s soap opera about a nocturnal, gregarious wild swine is half the fun of Studio Tan. “Greggery Peccary” is one of those cases where Zappa’s storytelling overshadows the music, certain to please anyone who still prays at the foot of “Billy the Mountain” (Billy and Ethel even make a brief cameo here). The gist of the story is a marketing executive who invents the calendar (and, thus, time), incurring the wrath of hunchmen (and hunchwomen). I suspect this was intended to be part of Hunchentoot, but that’s just a hunch. The remaining songs offer a little something for everyone: the silly send-ups associated with Flo & Eddie (“Let Me Take You To The Beach”) and the mutated classical/jazz/rock monsters of his early ‘70s masterpieces (Burnt Weeny Sandwich et al). It’s an eclectic venture, which is to be expected when a nine-album opus is peeled off in single albums, but among the Läther litter this is, in the words of a very famous spider, some pig. 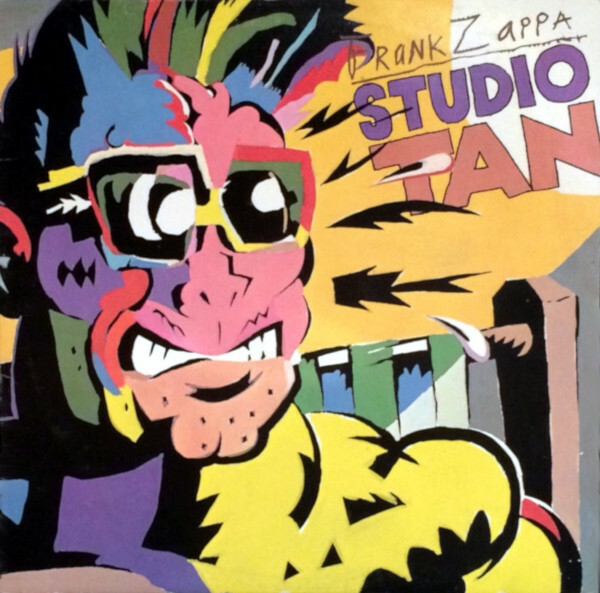 Given what Zappa was releasing at the time, you’re less likely to get burned with Studio Tan than a Zoot Allures. It’s not essential music, if only because fitting these pieces into the original puzzle calls for some historical revision, and yet it is eminently enjoyable. In fact, pound for pound, Studio Tan might be one of Frank’s funniest records. And fans of Zappa’s ambitious classical/jazz rock won’t mind hearing “Revised Music For Guitar & Low Budget Orchestra,” a radical reworking of the original “Music for Electric Violin and Low Budget Orchestra” that appeared on King Kong. Showing such different facets of the same diamond may be initially distracting, but Studio Tan remains dazzling for forty minutes. All songs written by Frank Zappa. Frank Zappa (guitar, vocals, percussion), George Duke (keyboards), Chester Thompson (drums) with Murray Adler (violin on B2), Mike Altschul (flute on B2), Max Bennett (bass guitar on B1), John Berkman (piano on B2), Don Brewer (bongos on B1), Jay Daversa (trumpet on B2), Earle Dumler (oboe on B2), Jock Ellis (trombone on B2), Alan Estes (percussion on B2), Bruce Fowler (trombone on A1/B2), Tom Fowler (bass guitar on A1/B2), Pamela Goldsmith (viola on B2), Dana Hughes (bass trombone on B2), Paul Humphrey (drums on B1), Eddie Jobson (keyboards & yodeling on B1), Jerry Kessler (cello on B2), JoAnn Caldwell McNab (bassoon on B2), Malcolm McNab (trumpet on B2), Edward Meares (upright bass on B2), Davey Moire (vocals on B1), Victor Morosco (saxophone on B2), Ray Reed (flute on B2), Emil Richards (percussion on B2), John Rotella (woodwind instruments on B2), Sheldon Sanov (violin on B2), Ruth Underwood (percussion & synthesizer on B3), Don Waldrop (trombone on B2), James “Bird Legs” Youman (bass guitar on B3), Graham Young (trumpet on B2), Michael Zearott (conductor on B2). Produced by Frank Zappa. Art direction by John Cabalka. Design by Vartan/Rod Dyer, Inc. Illustration by Gary Panter. Released on elpee and 8-track on September 15, 1978 in the US, Australia and Canada (Discreet, DSK/M8D 2291), the UK (Discreet, K 59210), Brazil (Warner Bros., 36.096), Germany (Discreet, DIS 59210), Japan (Discreet, P-10612D) and Venezuela (Warner Bros., Lps.200.2492); reached #147 on the US charts. Re-issued on compact disc and cassette in 1991 in the US (Barking Pumpkin, 74237) and France (Zappa, CDZAP 44). Re-released on remastered compact in 1995 in the US (Rykodisc, RCD 10526) and Japan (Rykodisc, VACK-1234).